As the saying goes,’ Health is Wealth’, in today’s fast paced world the belief in this quote has even become even more compelling and convincing than ever before. Water, which manned our earth, which initiated life, which is parked in each and every cell of the human body, on which the entire universe is dependent, is needed to keep the human body fit, fine and free from all harmful foreign objects as 70% of the human body is built on water. 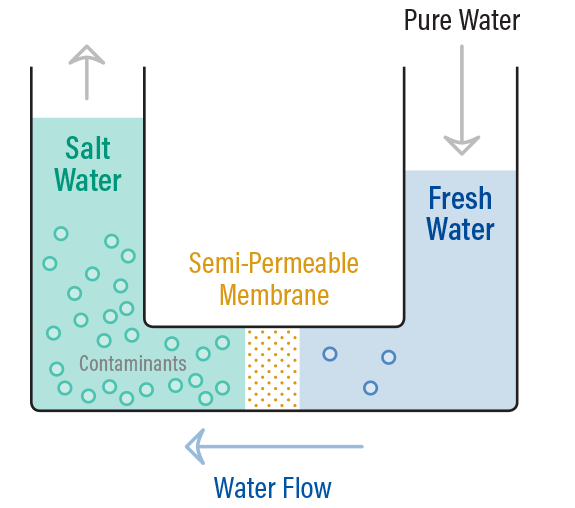 Water enters into the composition of the cells for them to function properly. By enabling hydrolysis reactions, water participates in the biochemical breakdown of what we eat. Water, as a main constituent of blood, contributes to the transport of nutrients to the cells. It helps in removing the waste products from our body through urine. Water has a large heat capacity which helps in limiting the changes in body temperature in warm or cold environment. Drinking water every day (approximately 1.5 litres*), and at regular intervals, 8 times a day (before, during and in-between meals), without waiting until you’re thirsty, is important as part of a healthy lifestyle! But today, our life savoir, Water has become contaminated due to various deadly forces in the form of harmful chemicals, pesticides, bacteria, industrial waste leading to water pollution. Is there an answer to this universal problem which is on the rise with every passing minute? RO water: Reverse osmosis (RO) is a water purification technology that uses a semi-permeable membrane to remove ions, molecules and larger particles from drinking water. In reverse osmosis, all the minerals that are present in the water such as calcium, magnesium, potassium, silica are removed along with all the bacteria’s, viruses and hardy minerals such as chlorine and fluorine. Due to these phenomena taking place the ratio of the TDS (Total Dissolved Solids) will always remain below 50. Whereas, according to WHO (World Health Organization) the Ideal ratio of the TDS of any drinking water should be in between 150-300). Water or H20 (Two Hydrogen atoms, one oxygen atom) is split into two separate streams of water – acidic waste water and drinkable alkaline water, rich in minerals. This altering of the H20 molecule happens in a sealed ionization chamber, under exact control of a dedicated microcomputer, to ensure the exact result time after time. As filtered tap water passes across 5 to 9 specially designed Titanium electrodes, it separates into the two components mentioned above. 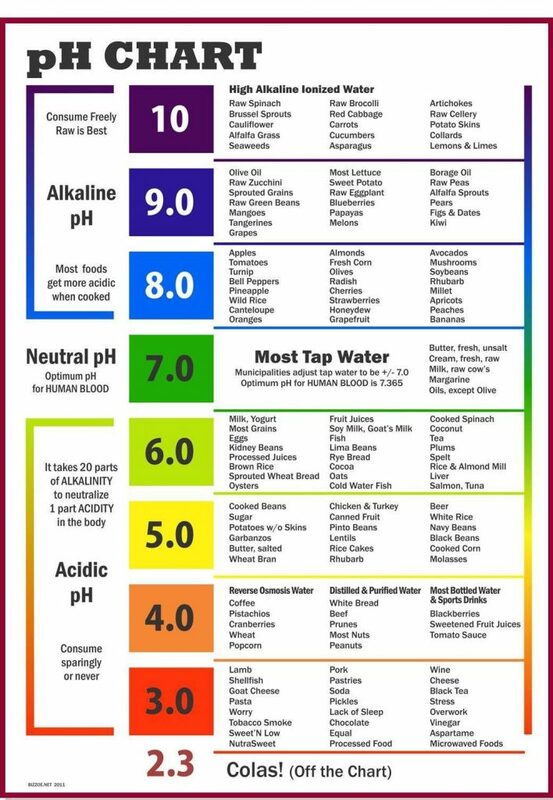 We drink the alkaline ionized water and we apply the acid water. How simple and wonderful! 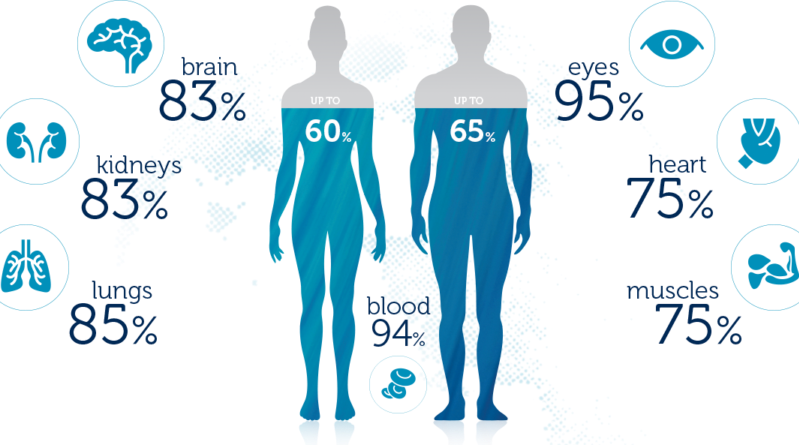 This phenomenon takes place inside a widget known as Water Ionizer which is an electric powered appliance and works on the principle of electrolysis. According to the WHO (World Health Organization), the proper drinking water parameters are TDS, p, and ORP. TDS represents the total concentration of all dissolved substances in water. TDS is made up of inorganic salts, as well as small amounts of organic matter. Common inorganic salts that can be found in water include calcium, magnesium, potassium, and sodium, which are all Cations, whereas carbonates, nitrates, bicarbonates, chlorides, and sulfates, present are all anions. Cations are positively charged ions and anions are negatively charged ions. The TDS parameters suggest that the ideal ratio of TDS in a drinking water should always be in between 150-300.
pH is a measure of hydrogen ion concentration; a measure of the acidity or alkalinity of a solution. The pH scale usually ranges from 0 to 14. Aqueous solutions with a pH less than seven are acidic, while those with a pH greater than seven are basic or alkaline. A pH level of an exact 7.0 is defined as ‘neutral’ because the concentration of H3O+ equals the concentration of OH− in pure water. Very strong acids may have a negative pH, while very strong bases may have a pH greater than 14. 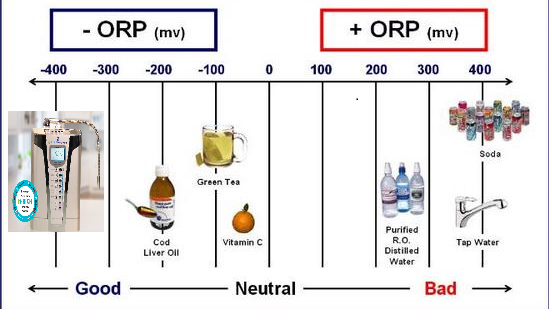 ORP is a measurement that indicates the degree to which a substance is capable of oxidizing or reducing another substance. A positive ORP reading indicates that a substance is an oxidizing agent. The higher the reading, the more oxidizing it is. A negative ORP reading indicates that a substance is a reducing agent. The lower the reading, the more anti-oxidizing it is. Miracle water, found in various countries in the world has claimed to cure health problems of many human beings. The spring at The Shrine of Lourdes in Southern France also known as the Lourdes Miracle Water. The Tlacote Miracle Water located in a small village ‘Tlacote’ of Mexico. So, why does the water from all these places referred to as ‘Miracle Water’? Do they possess any healing powers? If yes, then what are the elements confined in these water that gives them these unmatched healing properties? According to Dr. Sanetaka Shirahata (Graduate School of Genetic Resources Technology, Kyushu University), the so called miracle healing water contains Active Hydrogen (atomic hydrogen) and Hydrogen (molecular hydrogen). The healing effect which results in the health benefits is because of drinking this Hydrogen Rich Water. Alkaline water is the water that is slightly basic. It contains basic minerals such as calcium, magnesium, or bicarbonate. These compounds bind to hydrogen ions in solution, making the water more basic. This water has a pH greater than 7. The simplest way to make water alkaline is to add a substance with a pH higher than water; baking soda is a good example, with a pH of 9, as is bleach, with a pH of 13. A variety of products in the market claim to ionize water but the consumers have to be careful before taking advantage of these products which claim to provide the same supposed health benefits that of alkaline water. In the name of cleansing the water through chlorination process plus the ever-increasing water pollution, have caused the earth’s water to be totally acidic in nature. By drinking the same water, again and again, each and every body cell is gaining acid waste which in return is initiating an acidic process by the name of Acidosis where the level of oxygen in each cell decreases drastically and is not able to breathe. In return, the body cells endeavor different ways to nullify the effect in different ways trying to flush out these acidic cells. In this fight of action and reaction, the body tends to form a home for the most dangerous form of diseases. There might be a question arising in your mind if by any means if we are successful in flushing this acidic waste out from the body then will we be able to discard all the diseases in the future? The answer is ‘Yes’. 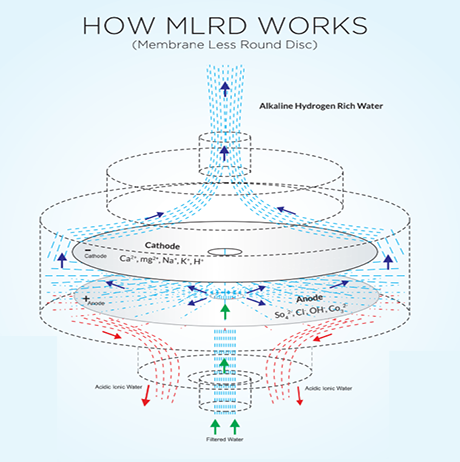 There is a way and it is known as Hydrogen rich Alkaline Water. This water contains a rich amount of Hydrogen which a Rich Antioxidant and Oxygen which helps the body tremendously to flush out the acidic waste. The source from where you can get this magical water is, of course the Himalayas which is not possible so we bring to you, at your doorstep, the world’s best Hydrogen Rich Alkaline Water System,’Dr. H-RICH’. A famous scientist, Dr. Otto Henrich Warburg, has also proved this for which he was awarded a noble prize. His famous saying goes ‘No Disease can survive in an Alkaline Environment’. Just gulping down 500 ml of Hydrogen Rich Alkaline water twice a day is enough to generate health defining benefits.